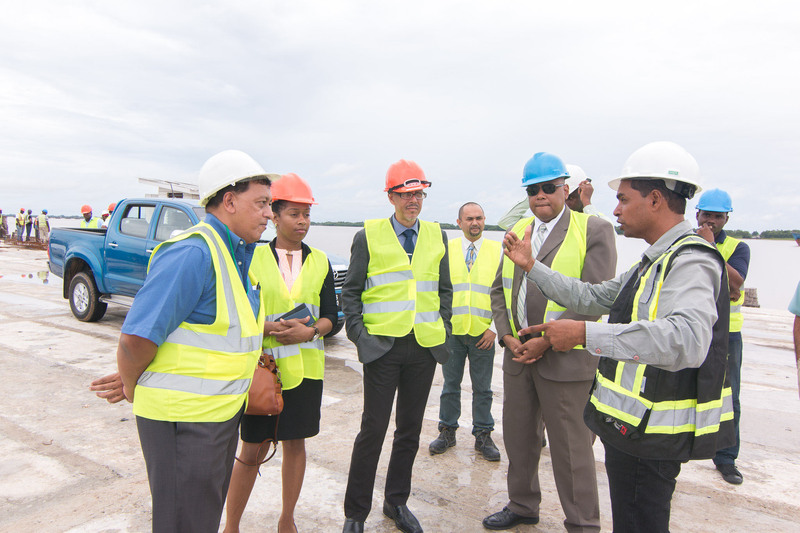 Local port operator Muneshwers Limited is developing a modern port facility at Houston, East Bank Demerara in a multi-billion dollar investment as the company aims to capitalise on Guyana’s developing oil and gas industry. Muneshwers’ Country Manager Robin Muneshwer (left), in talks with Minister of Natural Resources Raphael Trotman (right) and Minister of Business Dominic Gaskin yesterday. “Essentially, what we want to be is a one-stop shop for the supply vessel. When the vessel comes from the rig and it comes here, it must be able to satisfy all its needs, get its pipes, its fuel, its oil, its water, the powder plant, the mud plant, you know they come here, they get everything done and they go back,” Robin Muneshwer, the company’s Country Manager told Stabroek News during a tour of the facility yesterday. “That could be the holy grail for us in terms of the oil industry support,” he said. Muneshwers purchased the 28-acre property from timber company, Caribbean Resources Limited in 2014 for US$20 million. Since then, it has spent approximately US$10 million to develop the property and aims to become operational in July. Phase Two will see further investment as only a small portion has been developed in Phase One. “We’re only developing I would say maybe 15% of it so far, this is the first phase of development,” Muneshwer said. 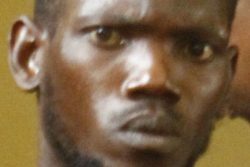 He said that there are a few more acres to reclaim which would make the property on the eastern bank of the Demerara River about 32 acres. An official of Tiger Tanks (left) speaks about the company’s work in Guyana during a tour of Muneshwers new port facility at Houston yesterday. “This project we think is of national importance and significance. We are a private company and we’re investing heavily in this project. We have all our bets on the future of Guyana in a time when business is slow for various reasons. We are fully invested in this project and in the success of Guyana,” he asserted. When completed, it would be the biggest active port facility in the country, Muneshwer said while adding that most of the major wharves in Georgetown would fit in the compound. Due to the size, the company can offer many services that other port facilities in the city cannot, he said. Muneshwers General Manager Curt Taylor said that the new facility would be fully equipped to handle any type of cargo, vessel, or operation including those in the oil and gas industry. He also highlighted the ease of access to outlying areas without all the congestion that exist from the other ports in Georgetown. 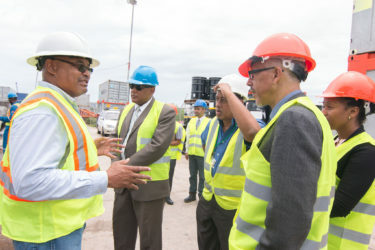 Muneshwers officials and Minister of Natural Resources Raphael Trotman and Minister of Business Dominic Gaskin discuss the company’s multi-billion project at Houston yesterday. Minister of Natural Resources Raphael Trotman and Minister of Business Dominic Gaskin who toured the facility yesterday lauded the project. 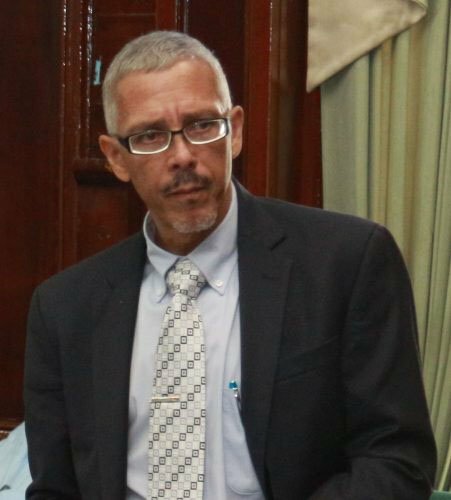 Noting one of the aims of the company is to offer facilities for services that support the oil and gas industry, Trotman pointed out that US oil company ExxonMobil which discovered large quantities of oil offshore Guyana last year, is the main player now. “I am hoping that they could see this as a facility that they can use. I know that as you ramp up your exploration into production, you will need larger space, you might even, more than likely need more than this but at least…Guyana and by Guyana I mean both the country and local entrepreneurs can provide services as needed,” he asserted. Trotman said that scores of companies are showing an interest in providing oil and gas industry support services in Guyana and he had a meeting with at least two persons in this regard yesterday including the head of the Energy Chamber of Trinidad Dr Dax Driver. 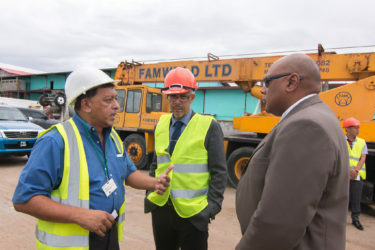 “The whole idea is to start looking at how we can partner local businesses with foreign businesses because while we welcome expatriates, we want to make sure that Guyanese are able to share and to learn,” Trotman said. Gaskin pointed out that the project is a major investment by a local investor. “We are very impressed by his foresight and by the facility that we have seen here, he certainly has the space that is required to take us through the next few years, so all in all, with the little that we have seen, we are happy, we are impressed and we are glad to see that our local companies are responding to a future that they perceive is likely to be a bright one and bring about an expanded economy,” he said. Muneshwer told Stabroek News that the first phase involves developing the facility so that it can handle a shipping line and containers. A pier and container yard has been built and construction of the shipping office which would house Guyana Revenue Authority and Customs officers as well as the shipping agency and other personnel, is ongoing. “We’re hoping to complete the first phase by July of this year at which point we’d be ready for business,” he said. It was noted that Tiger Tanks, a Trinidadian company that deals with disposal of hazardous waste, has already established a base on site and is providing services to ExxonMobil. With about four acres of container yard space already established, Phase Two would see further expansion of the container yard and the area next to the pier to make the land contiguous with the pier. “That would greatly enhance our staging area,” Muneshwer said. “We are targeting not just the container but of course the oil and gas industry as well…for that second phase,” he emphasised. The businessman said that the requirements for the oil and gas industry include a lot of space but not so much heavy infrastructure as is required by containers. He said the completion of the project would be based on the revenue generated from each phase which would be pumped back into the facility. He estimated that the project would take about 10 years to be fully completed but said that it is dependent on the revenue stream and if there is significant revenue, the development can be expedited. Muneshwer related that the company is in talks with other firms interested in utilizing the facilities. Interest has been expressed by various sectors inclusive of shipping, oil and gas, seafood processing, cement processing, and rice handling, he said. At this point, the businessman said, it would be difficult to say how the facility is going to be fully utilised as some industries are more lucrative than others. While focus would be on the lucrative sectors, ideally there should be a good mix in the facility so that it is diversified and any risk is spread around rather than investing in one single industry or company, he said. “We’ve had many interests, we’ve had some multinational companies come to us who want to lease the facility so they could use it for their own purposes, we are entertaining offers but at the same time it’s a very difficult game…you don’t want to commit yourself on a long term strategy and you lose out,” Muneshwer emphasised. He said that they are also trying to focus a lot on what they can do themselves, and in this case, they will be able to hire local people mostly, unlike foreign companies. By the end of the first phase between 70 to 100 people including construction, security, and other workers would have been employed, he said while noting that construction will continue in the other phases. Muneshwer disclosed that officials from ExxonMobil have visited the new facility repeatedly and have shown great interest. He recalled that Muneshwers had bid for an Exxon project to support current operations but was not successful because at the time, the facility was not complete. During their visit, Exxon officials have noted that the site has the size to handle multiple well operations, the businessman disclosed. “Multiple wells is when they go into production mode,” he explained. With Tiger Tanks already on site, the businessman said that they hope to attract other companies that provide support services to the oil and gas industry such as spare parts for the rigs so that it becomes a one-stop shop. He noted that the oil and gas industry require many support services and a lot of it is conducted right now in Trinidad. Exxon or any other oil company would prefer to have these services provided locally due to costs and other factors but Guyana does not have the infrastructure and technology among other things to provide such support “which is why we are trying to jumpstart this process like this facility here,” Muneshwer explained.